When a fruit ripens, many biochemical changes occur. The most obvious of these is the color, aroma and firmness of the fruit. Although illegal in many countries, calcium carbide (CaC2) is used to accelerate the ripening process. This allows growers to pick fruit sooner and to handle fruits when they are green and less susceptible to bruising or damage. Calcium carbide combines with moisture in the air to release a gas called acetylene, which acts the same way as the natural ethylene fruits produce when ripening. Industrial grade calcium carbide may contain arsenic and phosphorus, which can be fatal to humans and other animals. Calcium carbide is a synthetic material made from limestone, and it is illegal in many countries to use this chemical to ripen fruits. Several serious health risks are associated with calcium carbide, but it’s controversial if the amount used for ripening fruit is enough to cause harm to humans. Some health hazards include carcinogens, arsenic and phosphorus. Symptoms of poisoning include vomiting, diarrhea, burning or tingling sensation, numbness, headache and dizziness. The effect of calcium carbide on fruit is that it appears to be ripened, therefore more appealing to a customer. However, in most cases, the sugars in the fruit aren’t accelerated at the same rate and the fruit is not as sweet as it might have been had it matured naturally. Fruits may be more acidic, and they have a shorter shelf life. They may be firmer and more fibrous, as the flesh hasn’t matured as quickly as the skin. Calcium carbide is used in many countries simply because it is cheap and effective at producing a visually beautiful fruit. Calcium carbide, when combined with water, produces acetylene gas, which mimics ethylene. Ethylene, which fruits produce naturally in the ripening process, has proved to be very expensive when used to accelerate fruit ripening. Ethenyl appears to be a promising and relatively cheap substitute and has no harmful side effects. The fruits most likely to undergo calcium carbide ripening are guava, apples, pineapple, papayas, bananas and especially mangoes. In pineapple plantations, a few granules of calcium carbide was dropped onto the growing point of the pineapple plants, which promoted even and uniform flowering. 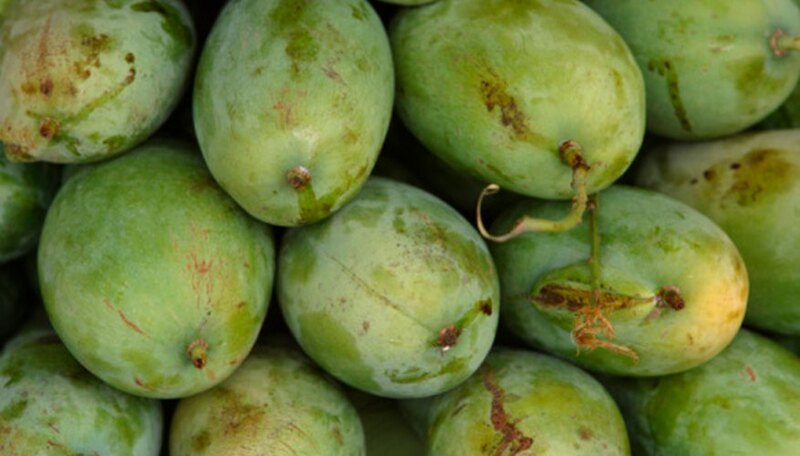 Mangoes are of special concern in countries such as India, where government agencies locate and destroy mangoes found in open markets where this illegal ripening method is likely to be used.